Water has always been an important commodity in the Arizona desert. For nearly 50 years, farmers in the East Valley struggled to water their fields through a primitive and unreliable patchwork of canals. When Dr. Alexander J. Chandler arrived in Arizona, he sought to rectify this situation. 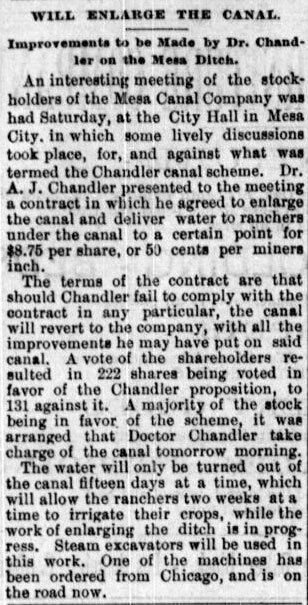 In 1891, after two years of negotiations, Dr. Chandler was awarded a contract to expand the Mesa Canal. At that time, the Mesa Canal was a hand-dug trench that brought water from the Salt River to Mesa, and was cooperatively managed by the farmers that it served. Dr. Chandler promised to improve the canal at no cost to the farmers, as long as he could use any excess water gained from the improvements. Click HERE to read articles describing the work to expand the Mesa Canal. To expedite the work of improving the Canal, Chandler contracted with the Marion Steam Shovel Company to purchase two floating steam powered dredges. These dredges allowed for the Canal to be dug to the bedrock, preventing the loss of water into the Valley’s sandy loamy soil. The same type of steam dredges were later used in the excavation of the Panama Canal in the early 1900s. These technological wonders operated 24 hours a day, creating a spectacle that drew local and national attention. Chandler paid $50 per day for a four man crew and fuel to operate the machines around the clock. The thousands of cords of wood required to fuel the metal monsters was acquired from dismantling the abandoned Fort McDowell on the Verde River. People flocked to see the dredges in action. In this photo, two young ladies posed for a photo in front of a dredge as it worked. The expansion of the Mesa Canal provided so much additional water that Dr. Chandler was able to create two new canals. The first, the Consolidated Canal, took water to the 18,000 acre Chandler Ranch, which ultimately became the city of Chandler that we know today. Dr. Chandler ran the second canal, the Tempe Crosscut Canal, over the edge of the mesa, creating a hydroelectric power plant that his brother, Harry Chandler, operated. The power plant provided power to the communities of Mesa, Tempe, and Chandler. After the canals were finished, the dredges were contracted out to expand other canal systems throughout the Valley. Eventually Dr. Chandler sold the smaller of the two dredges. The remaining large dredge floated on a pond just off the canal close to today’s Park of the Canals in Mesa. Oral tradition holds that this large dredge ultimately sank and still lies buried today. Archaeologists, however, have found no evidence of the dredge.